Excellent story of Luukanen, a pilot in the tiny Finnish Air Force who found himself outnumbered and supposedly outmatched, flying against the Soviets and the staggering numbers of aircraft they had at their disposal. During the Winter War the Finns fought on their own, with vague promises and moral support from the free world. Their aircraft were largely British and Dutch models, some of which were slower even than the Red bombers they tried to intercept!. However, Finland made the best use of the small number of planes they had at their disposal and when Round 2 (the Continuation War) came around the pilots of Finland managed to hold their own, flying aircraft provided by their "ally" Germany as well as Brewster Buffalos provided by the U.S.! 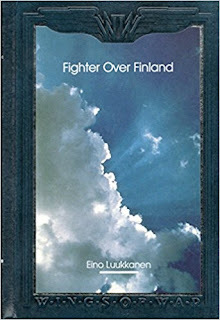 An amazing story, well-illustrated with maps, photographs and even descriptions of the aircraft involved, many of which saw very little combat outside of Finland.